When you mention ‘all you can eat’, most people would think of the the dodgy looking Family Food Court upstairs in Dickson (which is now closed) or the Star Buffet down in Kambah, but there is more that Canberra can offer. See below for more all you can eat options. Monday Madness 5pm – 9pm ( $24.00 pp). Choose one of the platters or better still go with someone else to get a chance to eat a bit of everything, just finish your platter before ordering more. 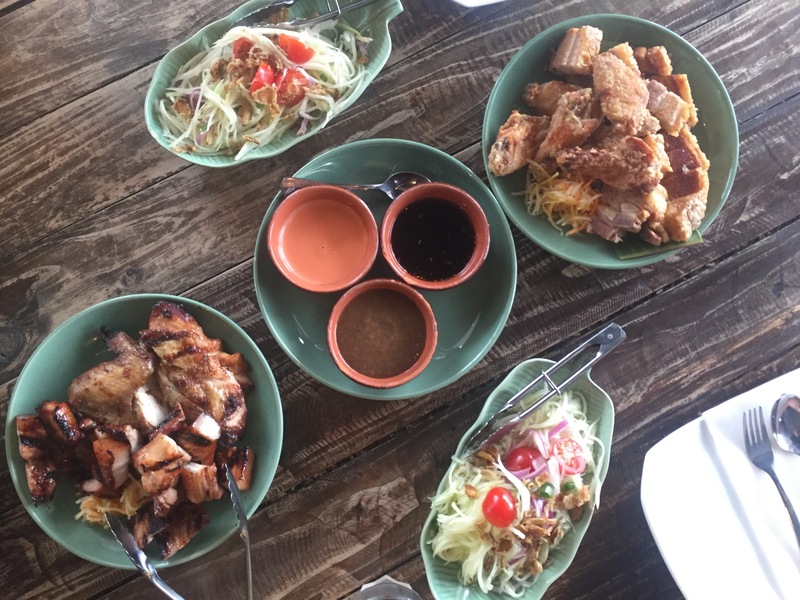 Monday Madness is served with unlimited papaya salad, rice and soft drink. 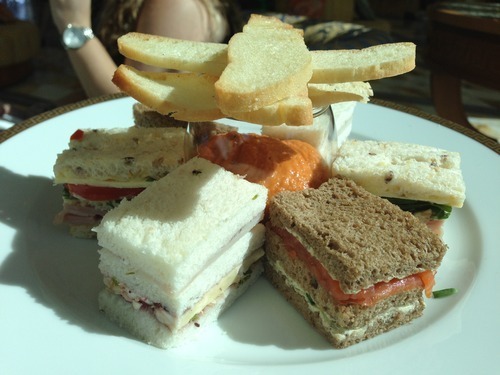 Enjoy the famous afternoon tea buffet during Friday (2:30pm to 5:00pm), Saturday and Sunday (11:00am to 1:30pm and 2:30pm to 5:00pm) at the Park Hyatt. They have an array of savouries, finger sandwiches, freshly baked scones, a selection of tempting cakes and slices and includes a glass of Lerida Estate Zenzi sparkling wine. This is one I’ve haven’t tried yet but they have a breakfast buffet, seafood buffet and a BBQ and roast buffet! This is the information I found on their website. Sunday BBQ and Roast Buffet with bountiful seafood, soup of the day with fresh bread, live cooking stations, gourmet salads and selections of antipasto, hot buffet dishes, farmhouse cheeses and decadent desserts ($85.00pp for cuisine only or $115.00pp inclusive of unlimited beverages for 2 hours that includes Australian sparkling, white and red wine, draught beer & soft drink). During the cold winter nights, you can warm up with a personal steam boat with your friends at Up 2 U in Belconnen. There is a large range of meat, noodles, vegetables, seafood options and condiments. If ‘all you can eat’ hot pot isn’t for you, you can also order their delicious claypot rice or BBQed skewers. That’s right, you can get all you can eat at a fancy pants trendy restaurant. Apparently no disclaimers, just let them know you’re ordering the all you can eat menu, order until your heart/stomach’s content and try and be out before the next seating (usually two hours). We greedily ordered all their desserts because we could! Their pasta range is A-MA-ZING! Read my latest visit here. There is a huge variety in the ‘all you can eat’ sector from sweets to Asian to modern Australian, all with a varying price tag. Which one will you be trying? After back to back eating sessions, I probably wasn’t feeling the hungriest when we stepped into Fancy Nance for high tea but FOMO got the best of me and I could not pass up the ‘I’m so Fancy’ option while my more sensible eating companions opted for the smaller ‘Pink Flamingo’ high tea. Follow the signs for Fancy Nance. A very mad hatter’s tea party feeling as you walk in. Despite the order written on the menu, things came a bit out of order but you did receive sweet things first and then ended on savoury which is usually how I eat things anyway. They must be going off the premise that life is short, eat dessert first. ‘Not so late’ carrot cake. I could not stop smiling while eating this. In short this was a deconstructed carrot cake but it was so tasty. The soft torn cake pieces delicately sat on top of the whipped cream cheese was genius but my favourite part was the candied nuts and different coloured carrots. This made me very excited for what was still to come. Complete with a carrot top! I felt a bit rushed when this board was placed in front of me with four different things on it. I didn’t eat fast enough and some of the ice creams started to melt and drip everywhere. Bubbles, marzipan, rum fruits and roast cinnamon ice cream. This was more complex than what meets the eye, just below the bubble surface was many complex layers of different textures and flavours. Cocoa nib creme brulee, pineapple and pina colada ice cream. This might have tasted sweeter if I had started off with this before the other desserts but by the time I got to this, the ice cream had melted into a puddle of mess and flavours weren’t as prominent because of the sweeter flavours from the other desserts. Chai panna cotta, pear cremeux, ginger and honey. 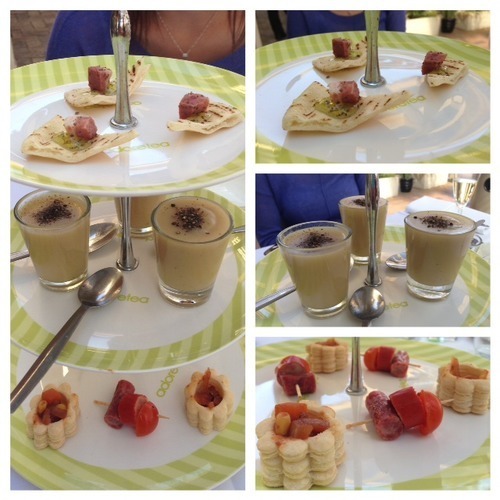 You had to dig down to get all the layers but the chai panna cotta flavour was the most prominent aftertaste. The texture of the panna cotta was incredibly smooth. Macaron I couldn’t tell what flavour it was, after eating the entire board the sweet flavours started to meld into one. Scones with 2 jams – roast capsicum jam and some other jam that I didn’t really try. As full as I was, I could not stop eating these scones with roast capsicum jam and cream cheese, it was sweet yet felt savoury at the same time. This might not be for everyone but I certainly enjoyed it. Pastries de jour. I started to slow right down after the scones because by this point, things arrived one after another and I could barely keep up. I slow nibbled at this but I didn’t find either one particularly extraordinary. Tapioca cracker, tomato and ricotta. There was a nice break before the savouries started to arrive and like most people who have a separate dessert stomach, I have a separate one for savouries. This was a nice transitioning course from sweet to savoury as it was definitely salty but it wasn’t heavy or overwhelming. Taco de Nance tuna, strawberries, avocado, tomato sorbet. This might sound like a strange combination but it really works well together, although I did find the corn taco shell getting a bit soggy and hard to eat as the sorbet melted. With the fish and fruit combined, it was refreshing on the palette. Chinese chicken balls. These came out extremely hot and not as I expected, I assumed it would be more like a meat ball rather than a doughy interior with a meat centre but it did soak up the delicious sauce very well. Beef cheeks with vanilla and purple carrots. This was really tender and the sweetness of the vanilla and carrots balanced out the heaviness of the meat. 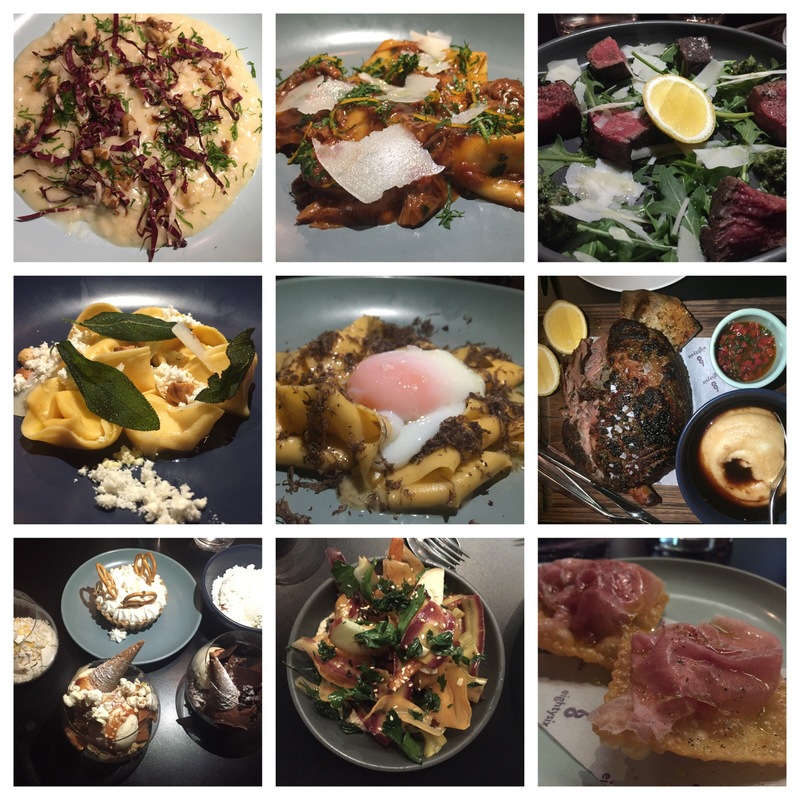 It wasn’t as good as the beef from MoVida, but it was definitely memorable. Tea, coffee or hot chocolate. We ordered our beverages first and since we had so much sweet on the way, I opted for green tea. Someone TimmyC managed to squeeze in an iced coffee with everything else ($5.50). Bubbles, marzipan, rum fruits and roast cinnamon ice cream. Chocolate and cherry long john. 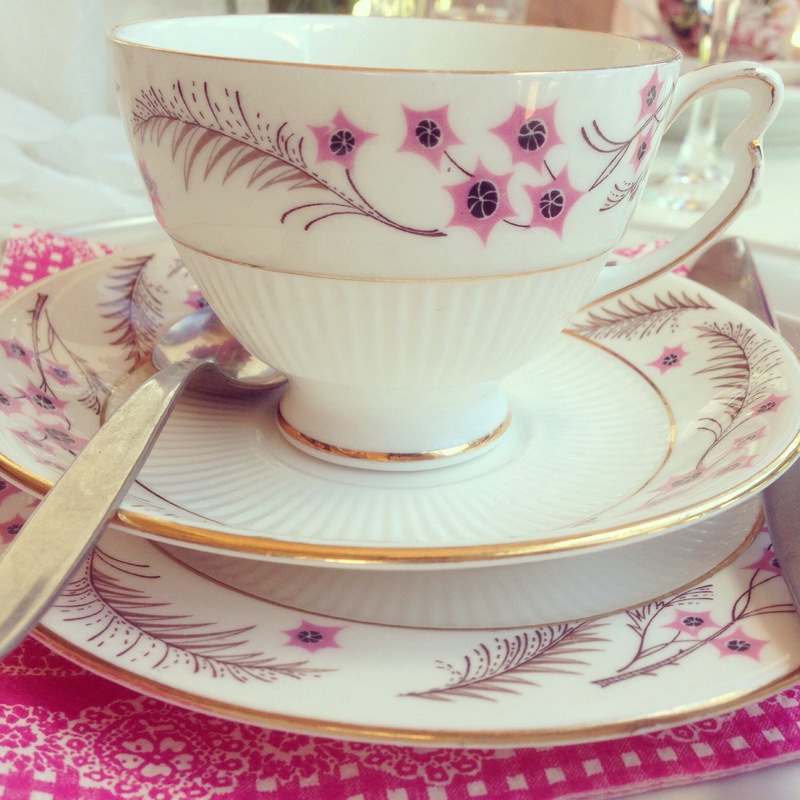 This was the pick of the Pink Flamingo high tea, so it was a shame that it was one of the first things to come out. It was like a cronut with many flaky layers with the perfect amount of cream and sweet toppings. Creamsticle. I thought these were adorable. Not much particular flavour to them but they are so teeny tiny. 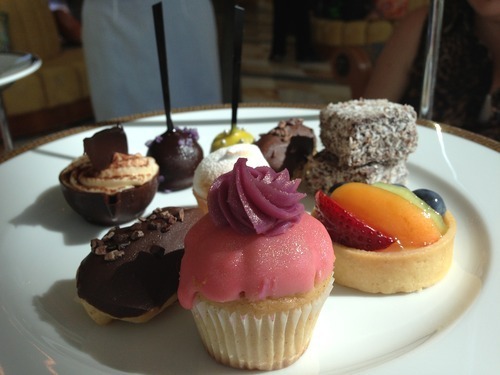 For a high tea with so many courses of sweet and savoury and also the obligatory high tea scones, it was definitely value for money compared to the high teas we get here in Canberra. What I thought was disappointing was for someone who specialises in sweets, I was hoping that Zumbo would push the envelope with his desserts and give me something new and exciting. I really enjoyed the carrot cake but from there, the dishes didn’t really compare; there were just lots of soft textured layered desserts. I thought the savouries had more variety and were more daring in flavour combinations and textures than the sweets. Still worth checking out though, it beats stake cake and tarts and crustless sandwiches any day. 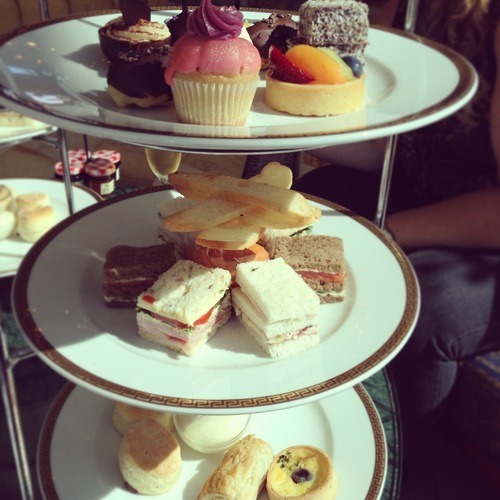 After having our lovely wedding reception in the beautiful Gandel Hall at the National Gallery of Australia, our event manager Kate, was super nice and invited us back for High Tea in their Wedgwood Tea Room because she knew how much we love our food. 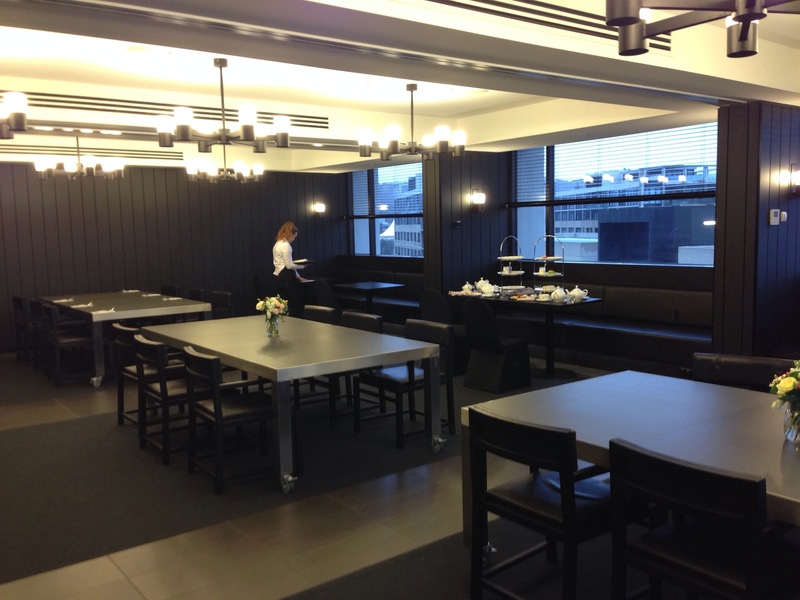 We arrived at the gallery and then clearly had no idea where the high tea was held until we asked someone and was directed to the Level 2 Mezzanine, apparently this space has only recently been open to the public. When we arrived we were greeted by a friendly face and seated by the window which looked over the gallery’s sculpture garden. 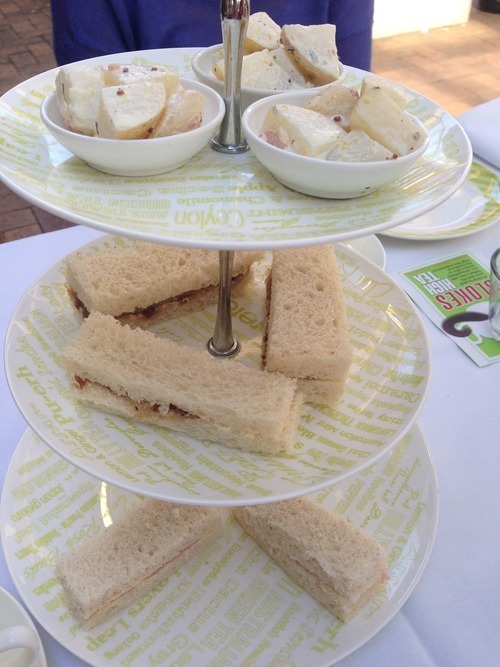 We dined as guests of the gallery but all day Wedgwood High Tea is $43.00 per person, there are also lunch options: the Farmhouse Board ($25.00 per person) and the Bushman’s Plate ($20.00 per person). Our tea orders were taken and we were left to admire the view and brush up on our tea etiquette (written in a booklet), not long after our little table with plain white linen was transformed into a high tea feast. Top tier: Dame Nellie Melba’s sublime opera cake; lemon and yoghurt curd tart with toasted meringue; petite peach Melba cake with white peach buttercream; jam drop shortbread tarts with lavender sugar. Bottom tier: soft mini brioche with cured salmon, dill creme and mustard leaves; ribbon sandwiches with citrus poached chicken and herb mayonnaise; ribbon sandwiches with cucumber, lime sour cream and fresh mint; mini asparagus, leek, and melted gruyere tart Separate plate: freshly baked buttermilk scones with local berry preserve and double cream My favourite picks were the chicken sandwiches and the opera cake but above all else, I fell in love with the Wedgwood china. For me, a lot of the high tea vibe comes from the atmosphere and the crockery (I’m a massive homewares fan) and I found the Wedgwood pieces were stunning. Each piece caught my eye because I liked the detail in the patterns and also liked how nothing matched. My tea cup pattern was perfectly named the ‘queen of hearts’. We couldn’t leave without buying gift vouchers for some special people and the vouchers themselves had the beautiful blue flower pattern. 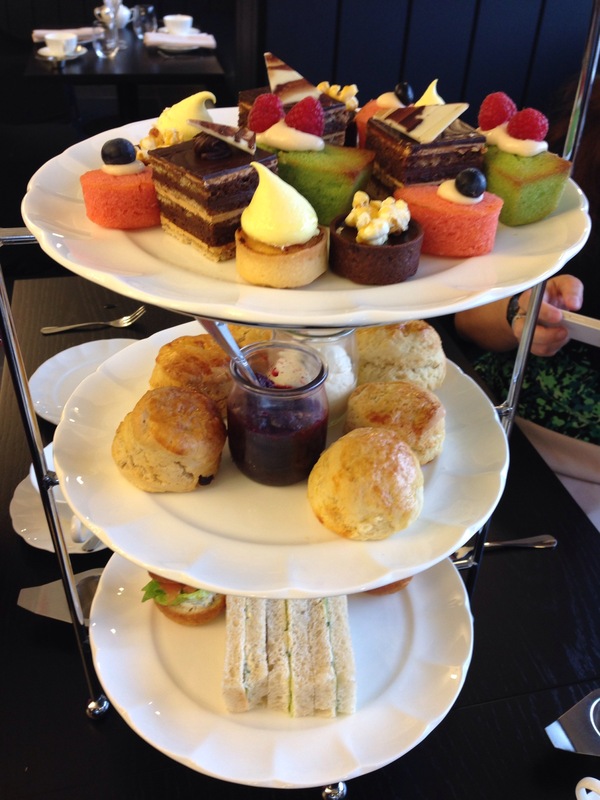 Phone: If you would like to book for high tea or lunch at the Wedgwood Tea Room without purchasing an exhibition package please call (02) 6240 6711. I was shocked to find out that one of my friends who loves tea had never been to Adore tea at Gold Creek Village so we made a date with more friends to go there immediately if not sooner. I booked a table inside because of the cold wet weather forecasted, which allowed us a two hour window for our reservation (I didn’t know there was a time limit, we just saw the next scheduled booking for the table). It is advisable to book ahead especially on the weekends as they are very busy and also have lots of varying high teas and parties (we happened to go on Mad Hatter’s tea party day). We all chose a different tea which made for a very pretty photo, I went with classic chai blended with milk. I thought the colour of my friend’s berry tea was beautiful. Not a drop was wasted. My usual ‘go to’ food regardless of the time of day are their scones or the poffertjes but friend was telling me how nice the apple pie was. I was torn between choices but as soon as she said that she would go halves between the pie and scones, I was sorted. Apple pie classic style apple pie served with vanilla ice-cream ($10.50). The pastry was very soft and semi sweet and apple pie obviously pairs perfectly with vanilla ice-cream, I just wish for the price that the pie was a little bigger or more filling. A close up of the apple pie. Scones served with cream and tea infused jams (about $9.50). Tea goes so well with scones so it almost seems like a ‘must’ when you come here. I really also enjoy their house-made jams. Chicken focaccia with gluten free bread (around $15.00). I looked over at my friend’s gluten free plate with envy. I usually am the savoury girl type and her plate looked goooood… I ‘adore’ this place, it’s a lovely venue to catch up over sweets and tea with friends and family. 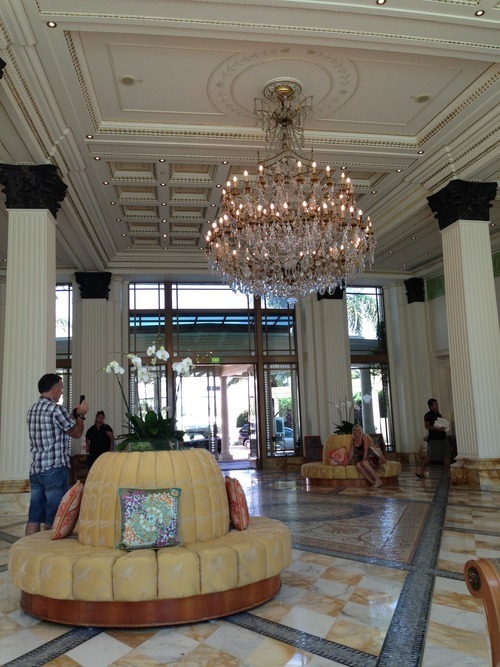 They are often very accommodating and the staff are super friendly and knowledgeable. 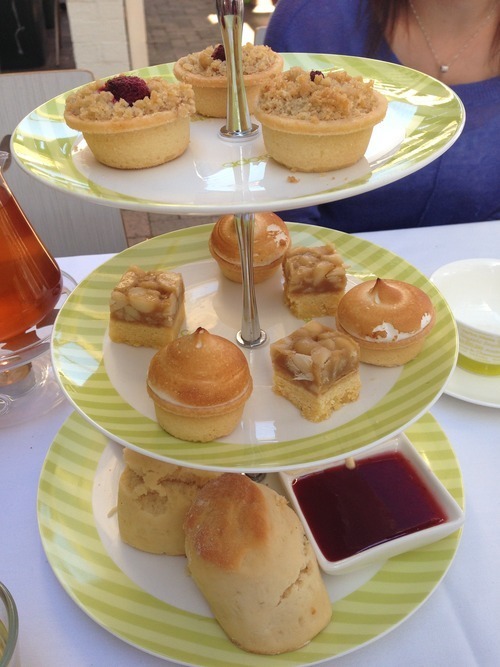 Check in store or online for their various high tea days and live music sessions. My wonderful foodie friend, fellow 101localhuman and blogger (see her fabulous blogs here and here, I barely have time to write one blog, how does she write two!?) 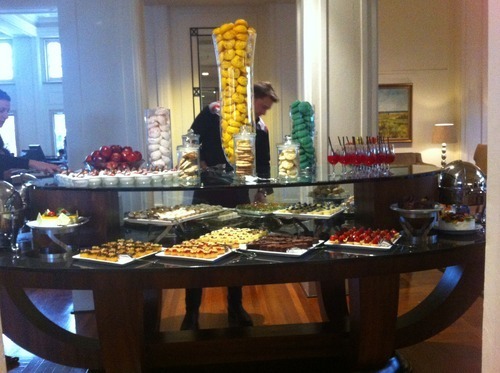 had arranged for a few of us to meet and exchange foodie news over high tea that the Burbury Hotel now hosts. 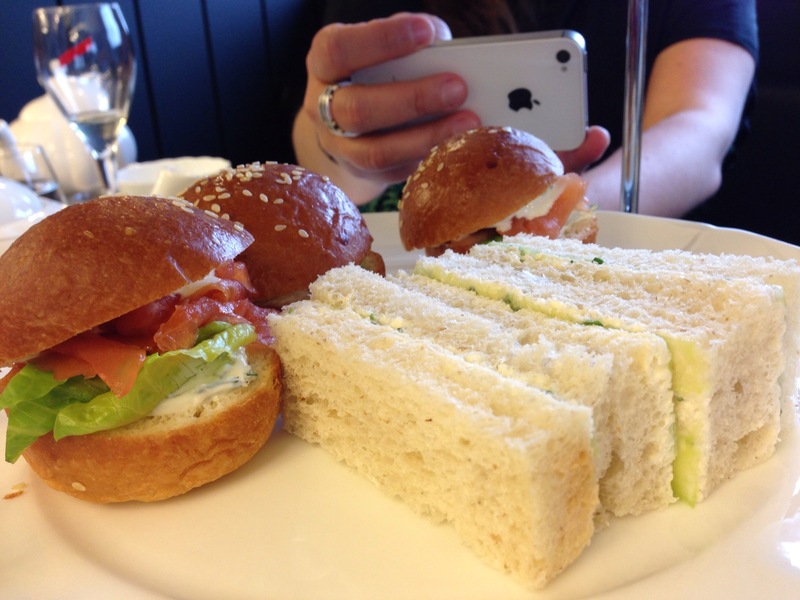 I’ve always been on the hunt to try all the high teas in and around Canberra and am close to finishing the list. 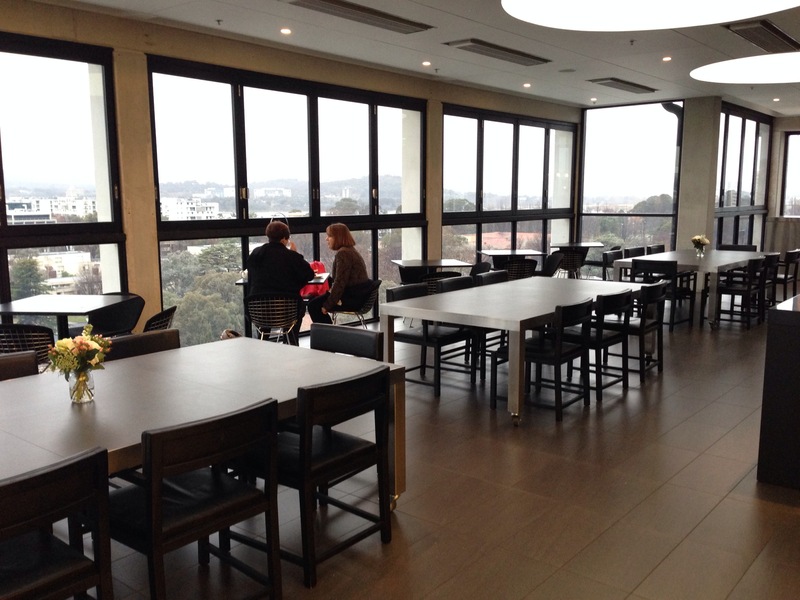 I was surprised to hear that the Burbury hotel now does high tea considering they have only used the Terrace area for functions and hotel breakfast but it is a good use of the space as it has gorgeous views of the city. Arriving at the 7th (top) floor, I was told my friends were already waiting. As I sat down to take in the beautiful views, the incredible amount of natural light this space has and quickly admiring other people’s sweets, I was promptly asked if I would like champagne to start to which I declined. Bottom tier~ I am a huge fan of catching up over cakes, TWG teas but I mainly went to catch up with my foodie friends. I miss how we all whip out all cameras and start clicking as soon as food arrives. 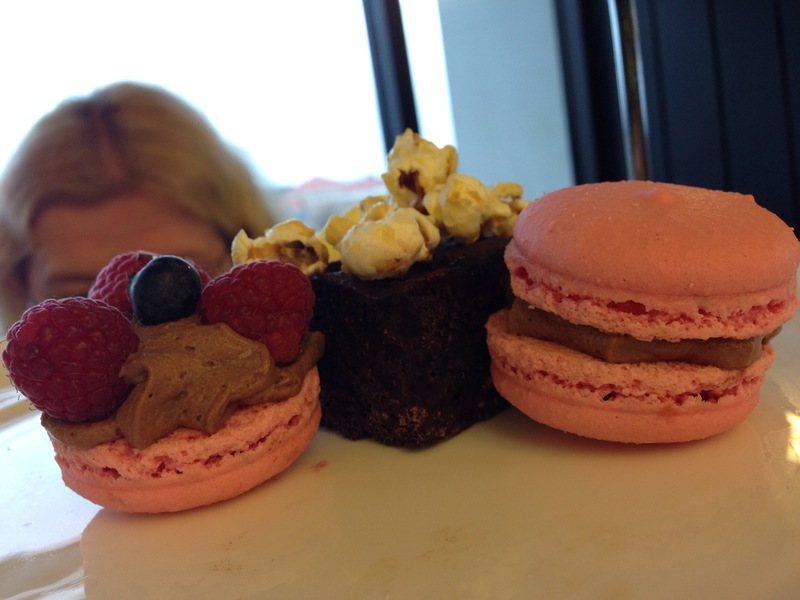 It looked like a last minute creation when the two halves of a macaron was split into two and decorated with chocolate filling and berries on top. An odd shaped gluten free roll served with ‘jam’ and cream. I don’t know if you’ve ever had untoasted gluten free thick sliced bread, but it’s not good. It was a cloudy wet day, but I could imagine on a gorgeous clear sunny day, this place would have beautiful views. One of the last tables to leave as well as leaving all our mess. 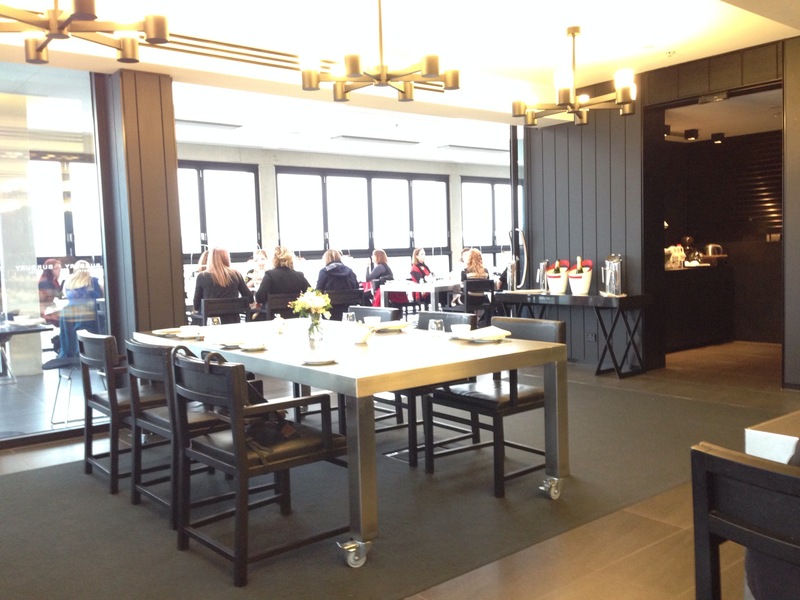 A mediore high tea at best but the views and the natural lighting is amazing. I would come again more for the atmosphere rather than the food, I do hope it improves though. 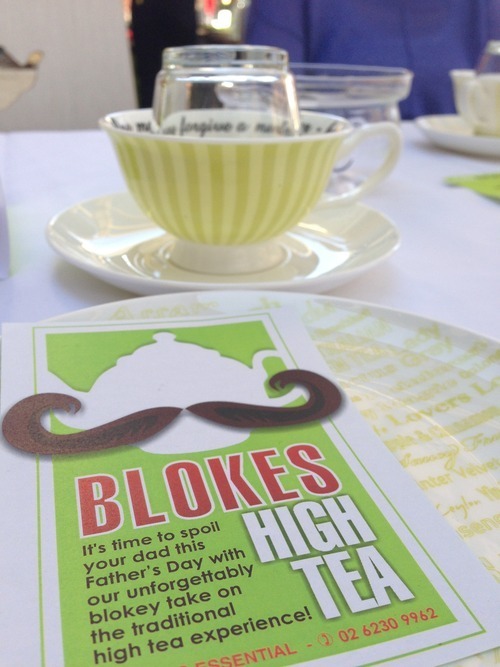 It probably wasn’t the best weekend to do High tea at Adore Tea being the Father’s day weekend but when I inquired what differed between ‘Blokes High tea’ and the normal high tea, the difference was minimal and I probably preferred the ‘meatier’ savoury options. The high tea was staggered out and timed with two savoury courses and two sweet courses over a leisurely one and a half hour period. 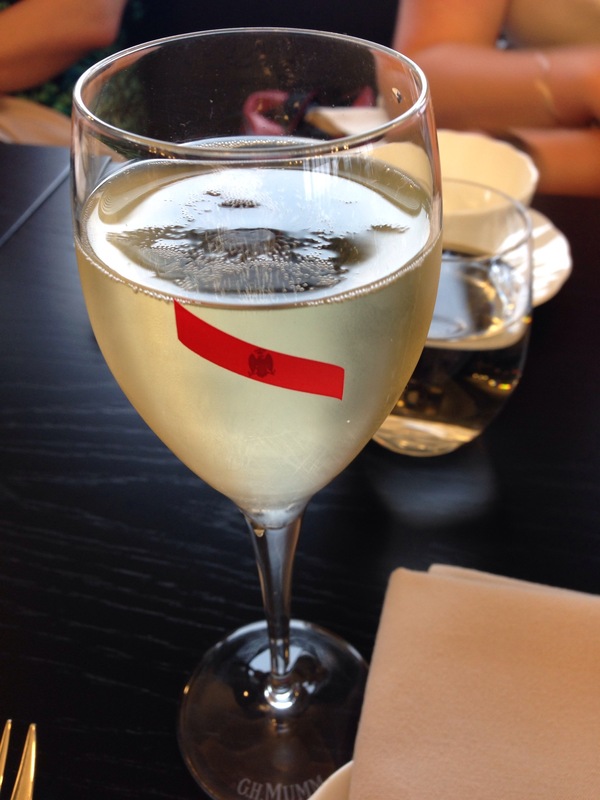 We were each greeted with an option of sparkling wine, a beer or a non-alcoholic sparkling wine. I should have just gotten the alcoholic option and given it away as the non-alcoholic sparkling wine tasted like bubbling sweet cordial. Top tier – potato salad. Not very creamy and almost watery. 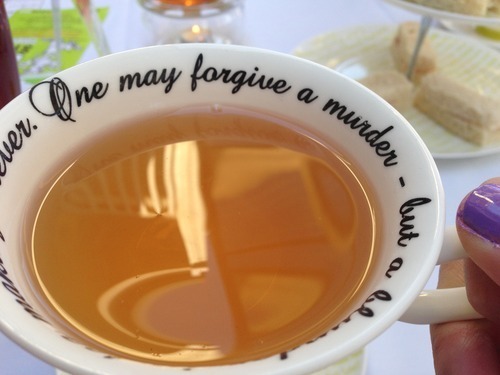 Not the best way to start the high tea. Middle tier – beef with onion chutney finger sandwich. The chutney made the sandwich particularly tasty. 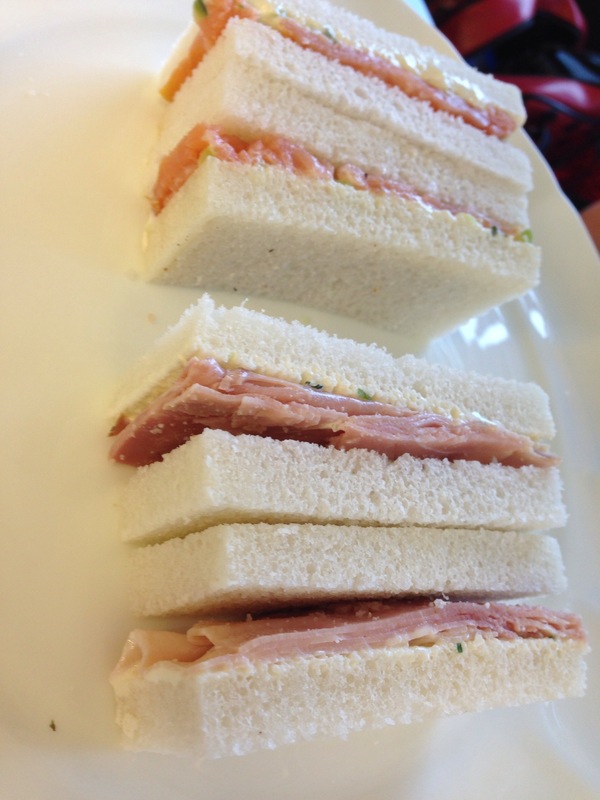 Bottom tier – ham and mustard finger sandwich. Very simple and too plain. 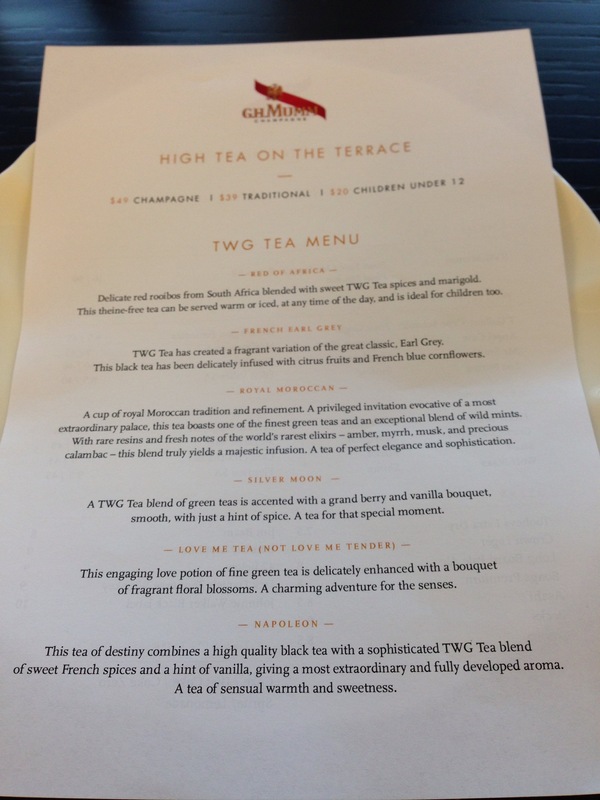 Matching tea – Oh I can’t remember exactly, but it was either Platinum Black or Earl Grey berries. Very nice. A party of three was probably not the best amount of people as it meant that three of us had to share one pot of tea, which still (just) allowed a cup of tea each but four people meant there was two to a pot. Top tier – Cracked pepper mountain bread and lamb with mint jelly. The cube of meat looked a bit unappetizing but it was okay as a savoury morsel. Middle tier – Potato chamomile soup made in house. I couldn’t detect the chamomile but the potato soup was nice and warm with a decent amount of black pepper. Bottom tier – ‘meat kebab’ and a different take on a meat pie, ‘meat pie voulevant’. The ‘kebab’ was a bit simple and I didn’t expect to find it at the high tea but it was much better than the voulevant, which I had to play ‘find the meat’ and because there wasn’t much sauce it was very dry. 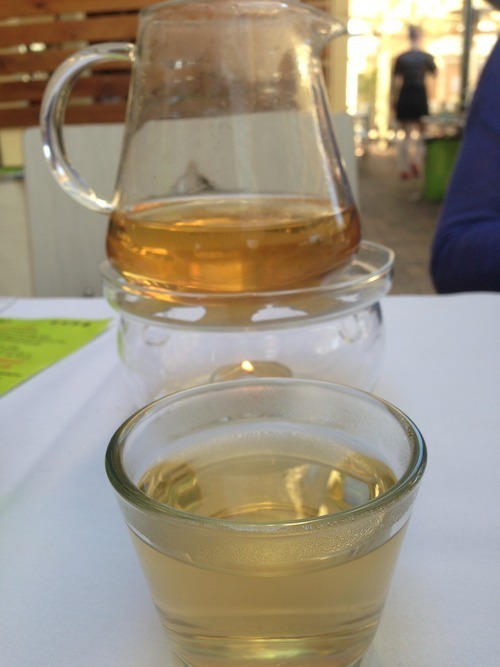 Matching tea – ‘Green with envy’ green tea. A lovely refreshing light tea to balance all the savoury food. Top tier – raspberry and apple crumble tart. Middle tier – lemon meringue tarts and macadamia and caramel slice. 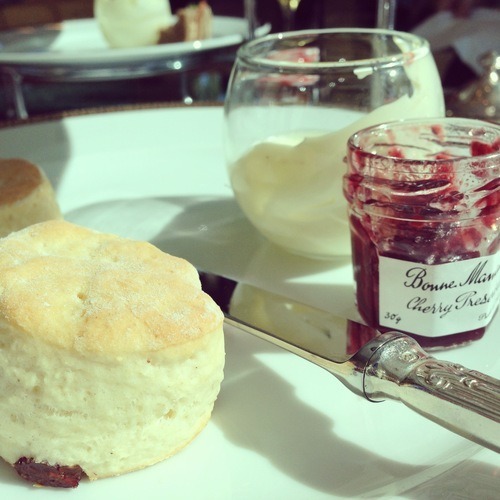 Bottom tier – warm scones with cream and house made jams (strawberry and mixed berry) infused with Earl Grey tea. I’ve always been a fan of their jams but the best thing for me on the tier is the macadamia and caramel slice, deeeeeeeelicious. 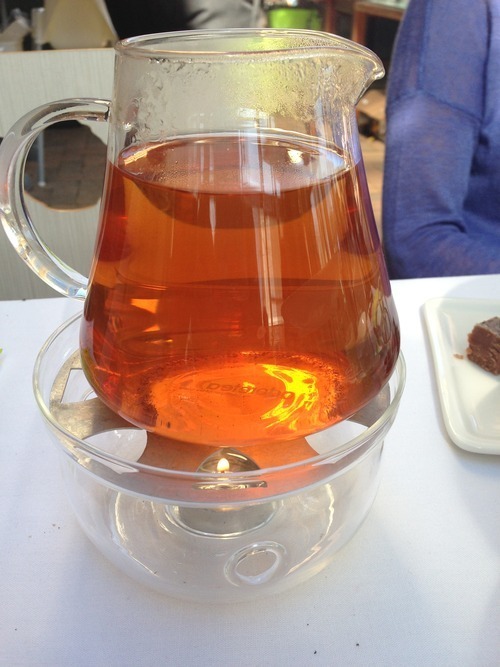 Matching tea – Rooibos Tea with caramel. I don’t usually like teas that smell sweet and had nothing for the palette but you could really taste the sweetness without the heaviness of sugar. 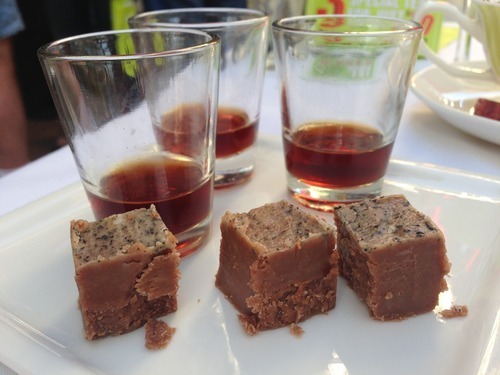 Final course – Nip of port with whisky infused fudge. The port was very smooth, not overly sweet and didn’t burn on the way down. The fudge was supposed to be infused with a little bit of real whisky but most of the flavours should have been from their whisky tea. I thought it tasted like the icing that you would get from a packet cake mix but it was better than getting sickly sweet OTT fudge. They had very friendly service and their knowledge of the food was impeccable. Overall the food was okay but I really do like the fact they have not only ‘matching teas’ with each course but have actively sort out to try all the include their tea infusions as an ingredient. 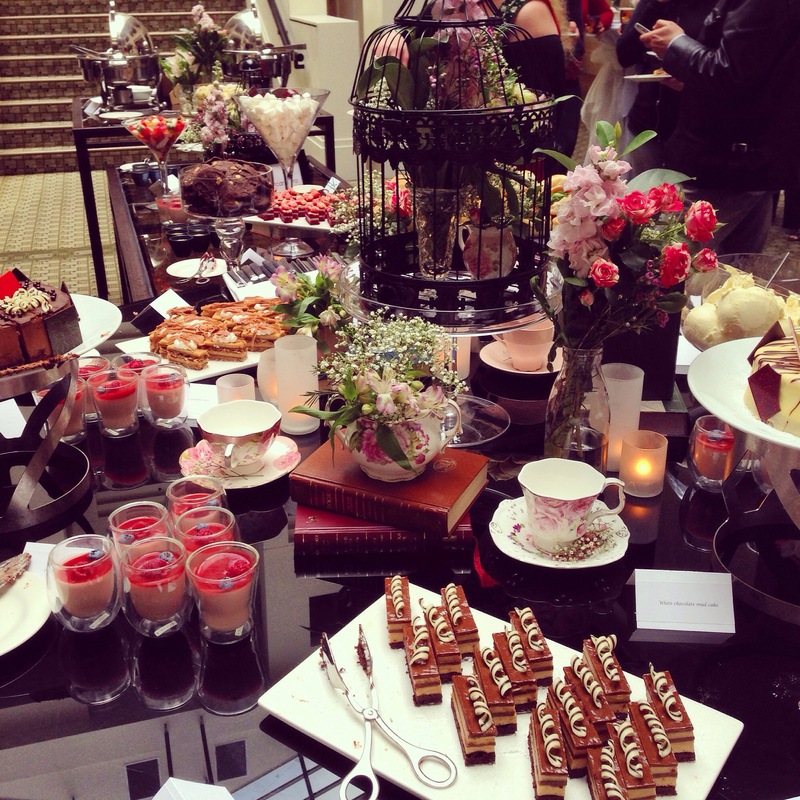 I’ve been to a lot of high teas in Canberra and this is one of the better ones. It is also lovely to enjoy the sunshine outside or their live music when they have it during the warmer months. They had chosen the best of the best of their teas to be included into the high tea to showcase their signature house blends. Once I dwindle down on my tea pile at home, I definitely coming back for their green tea. 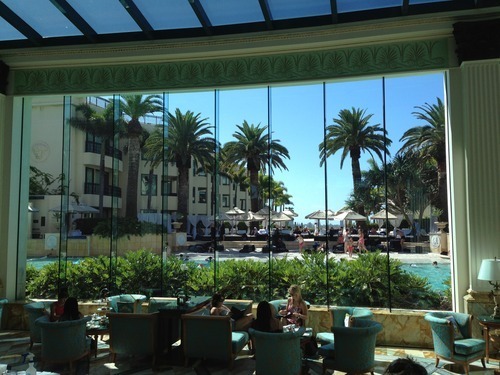 One of the ‘must do’s while I was at the Gold Coast was go to the Versace hotel and have high tea. Drinking tea while over looking the pool area with exquisite dainty sweets, it really didn’t take much convincing. Deliciously light scones with Bonne Maman preserves and whipped King Island Double cream. 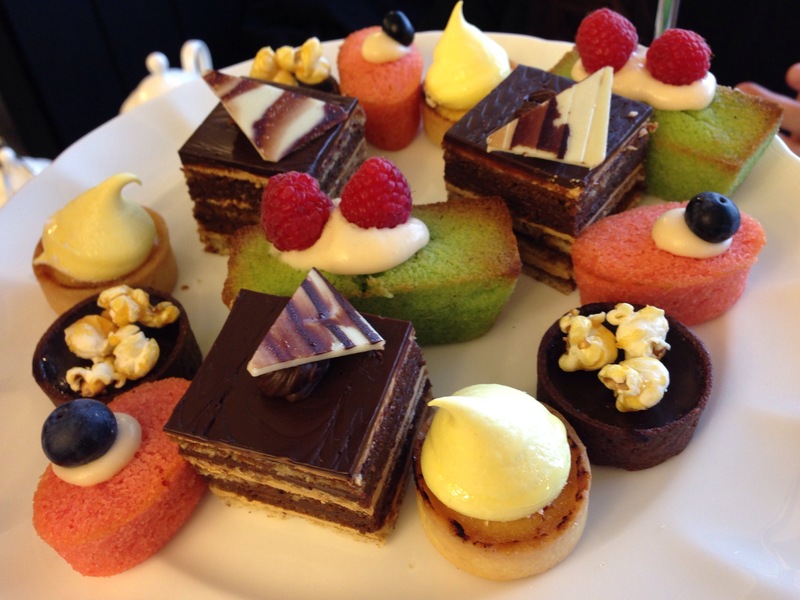 Heavenly selection of tailor made designer pastries, featuring cake pops, macarons, cupcakes, fresh fruit tartlet and more. Boulangerie assortment including homemade finger sandwiches with a range of bespoke fillings. 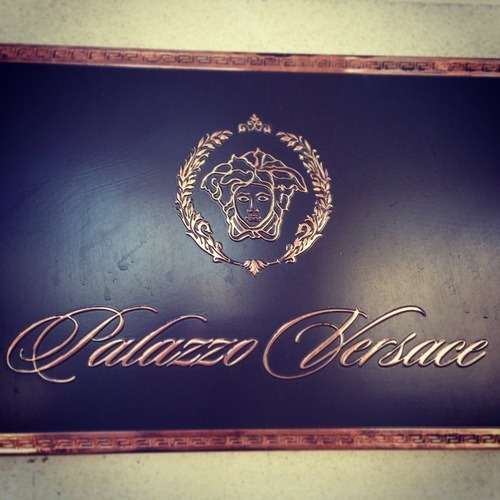 Your choice from our range of Versace Collection coffees or teas. 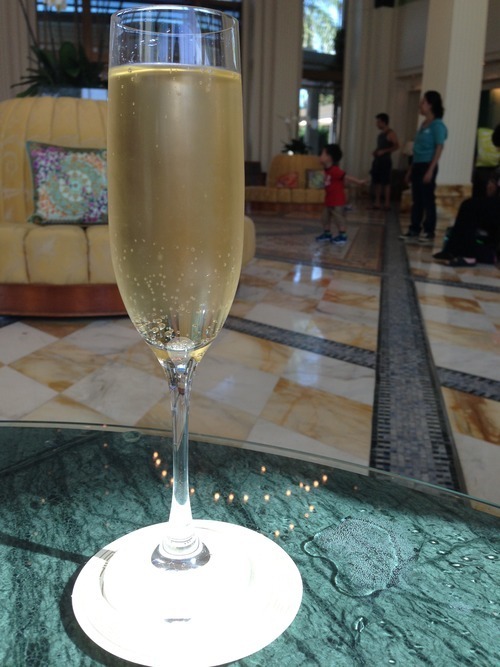 Includes a glass of Veuve Clicquot Yellow Brut Champagne. Hmmm, I thought it was odd that this tier was for two people but it didn’t have two of everything(?). Let’s break it down plate by plate although it isn’t necessarily the order I ate it. The plate of sweets including lamingtons, cake pops, a meringue tart, a fruit flan, a cupcake, éclairs and a chocolate cup. Crust less finger sandwiches surrounding a sun-dried tomato and capsicum dip. 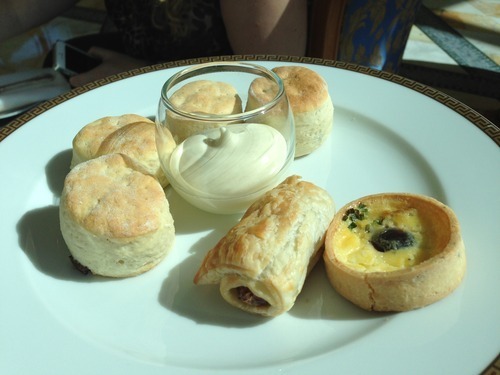 2 types of scones with double cream, a single sausage roll and a mini quiche. 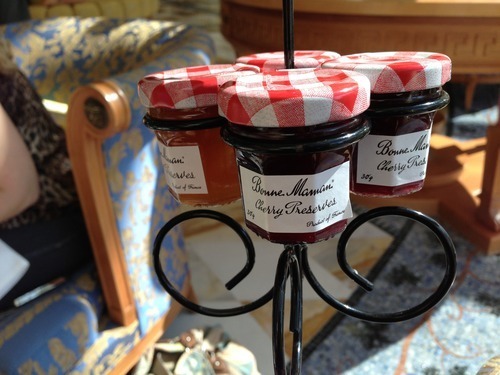 They have a cute little stand for all the jams. Time for scones with cream and jam. 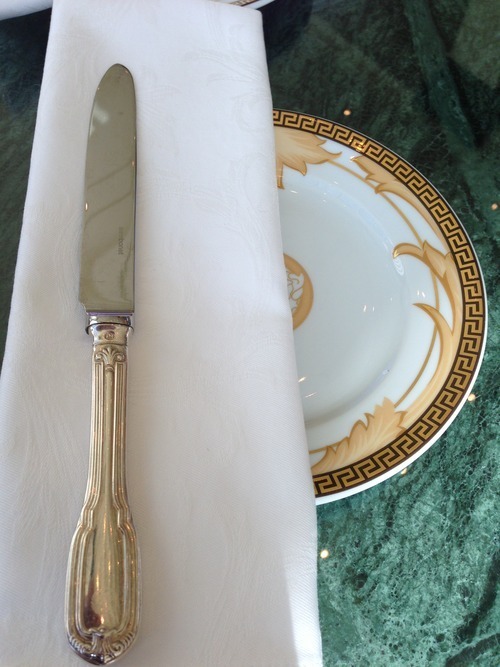 A few things better than others on the tier but this is more about the experience and the extravagance with everything adorning the Versace logo.